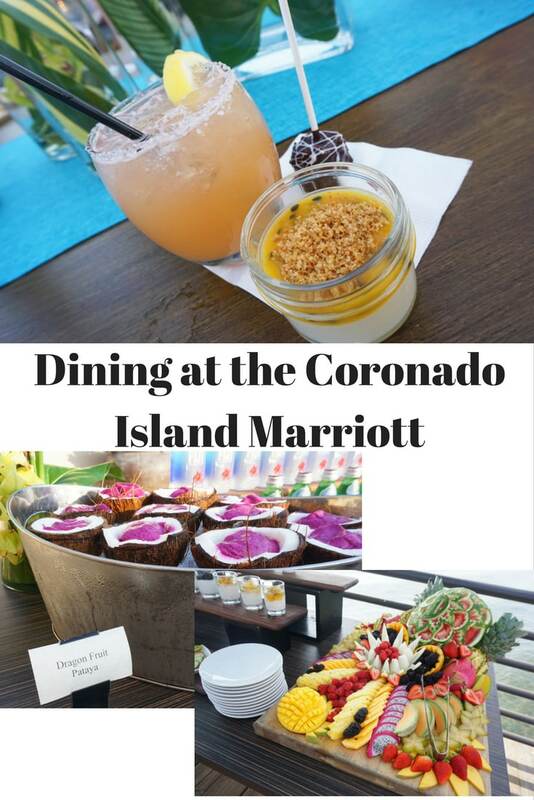 I recently had the pleasure of attending the grand re-opening of the Coronado Island Marriott Resort and Spa. 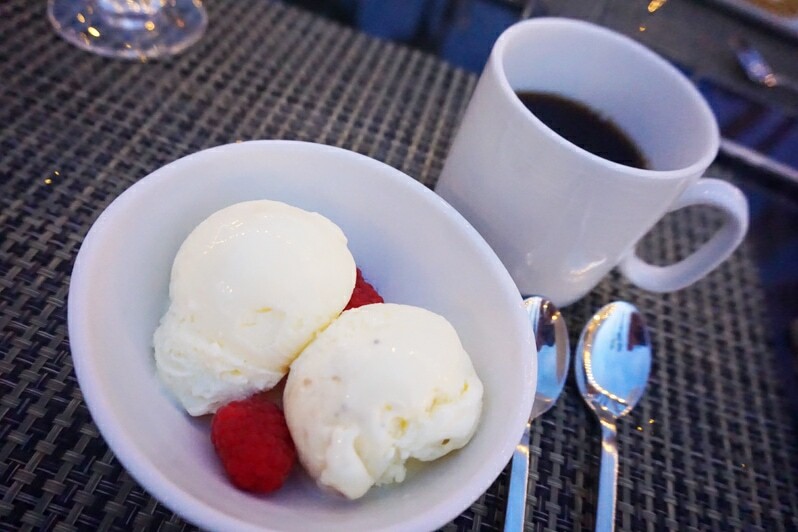 During my overnight visit, food was front and center of the newly renovated resort experience. 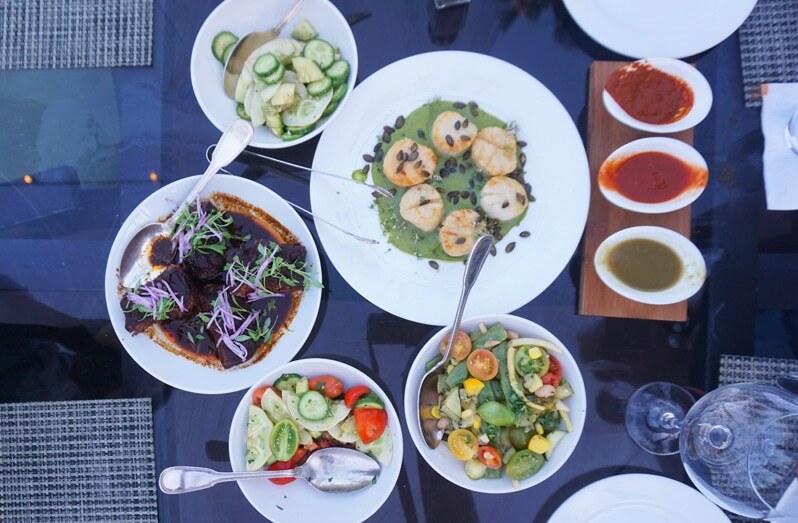 Executive Chef Michael Poompan’s culinary style incorporates fresh seafood, locally sourced produce and a touch of the Baja Mediterranean flavors found south of the border. The grand re-opening event started with a tour of the property. 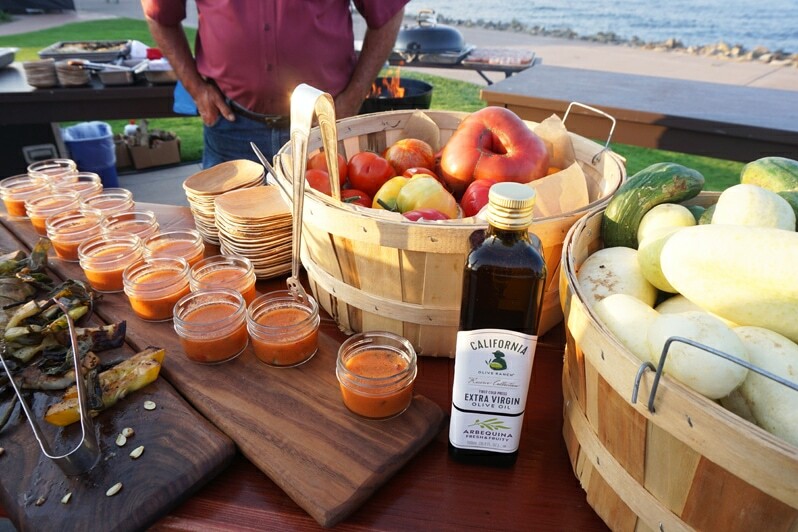 Our first foodie stop showcased a bounty of locally sourced produce the Coronado Island Marriott Resort and Spa incorporate into their dishes. 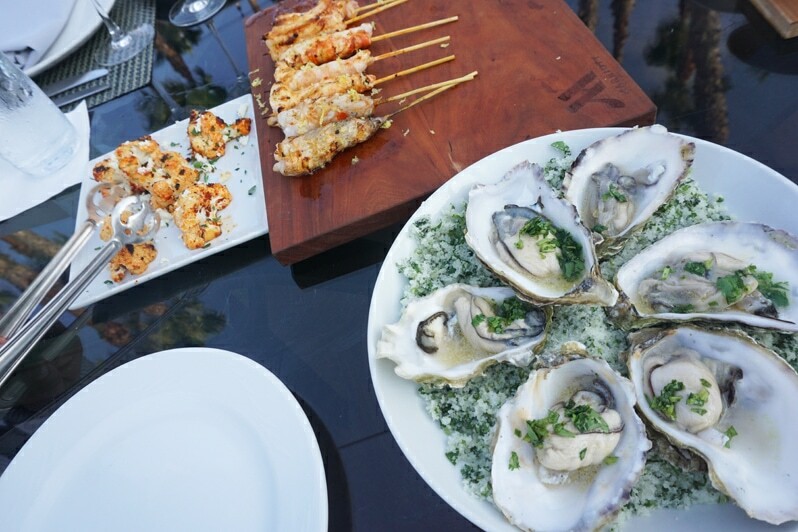 The grand re-opening party was a combination of a sneak peak at the newly renovated rooms as well as a celebration of coastal California cuisine. 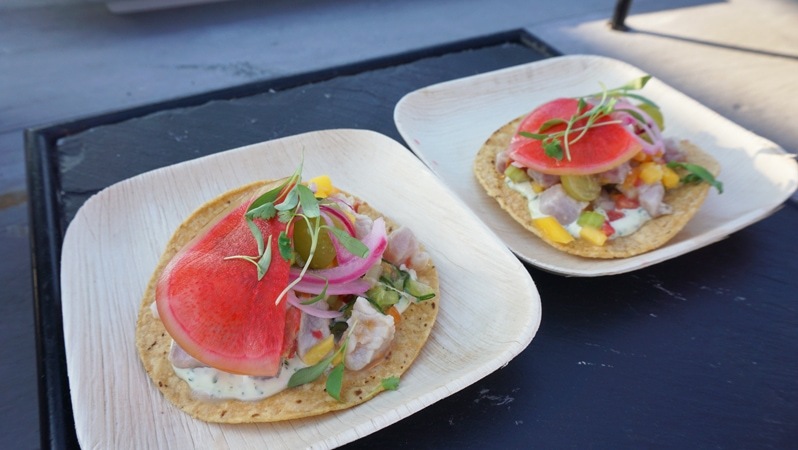 There were multiple food tasting stops during the property tour that included spicy fish tostadas with fruit salsa, paella, gazpacho soup, tasters from local breweries and spa cuisine. 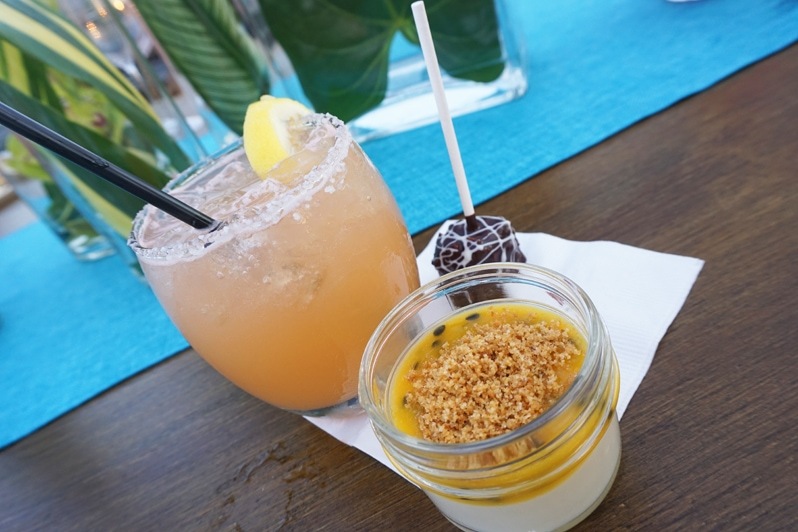 The Coronado Island Marriott Resort pastry chef spoiled us with an array of sweets at the opening party. My favorite was the chocolate truffle lollipop. 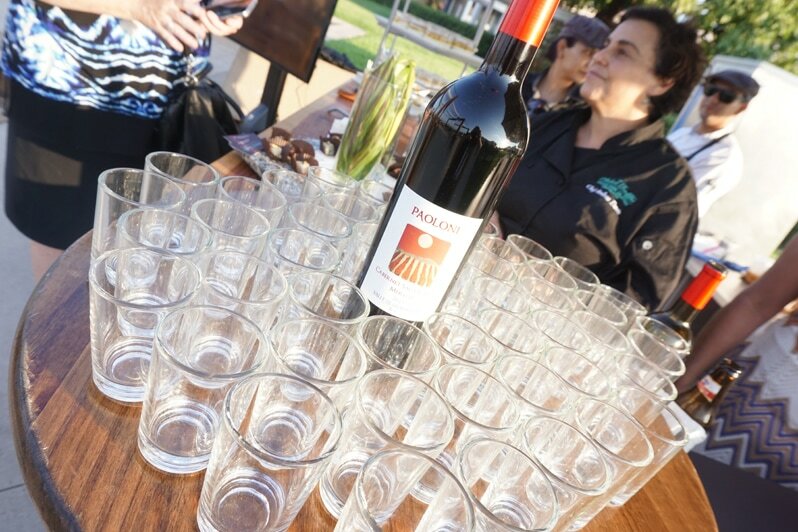 Specialty drinks were also being served as well as a variety of Baja wines. 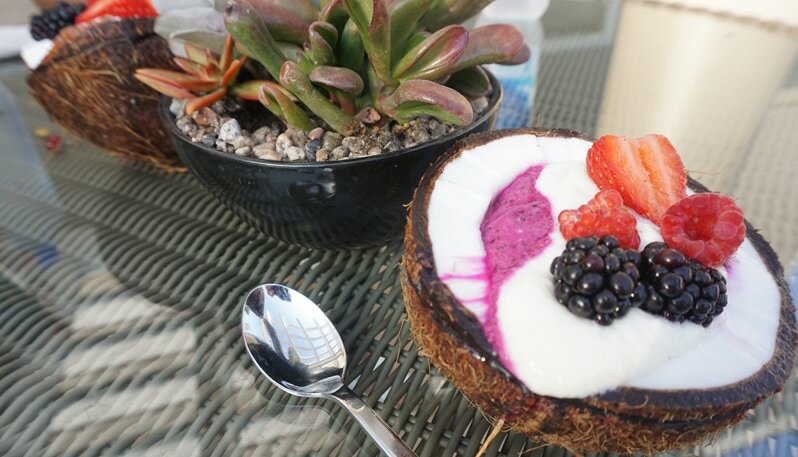 The spa at the Marriott Coronado Island offers a healthy conscious menu. 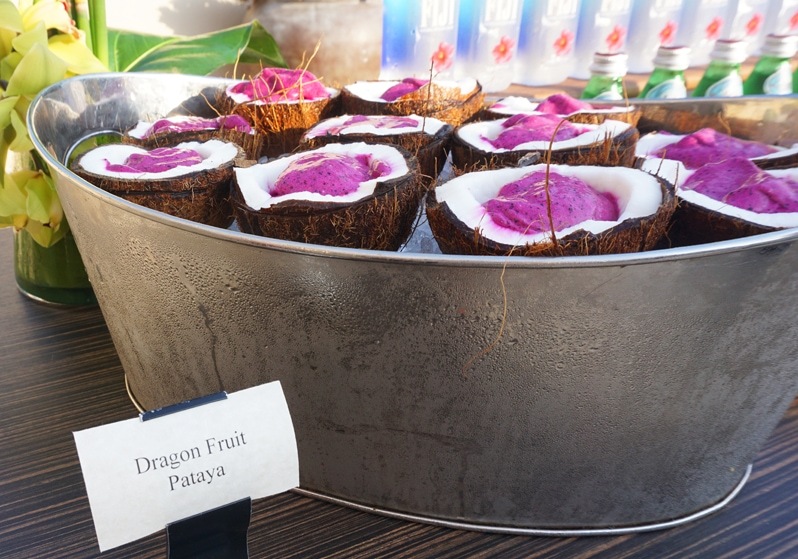 For a pre-yoga snack, we were served pitaya bowls with toppings of granola and fresh fruit. 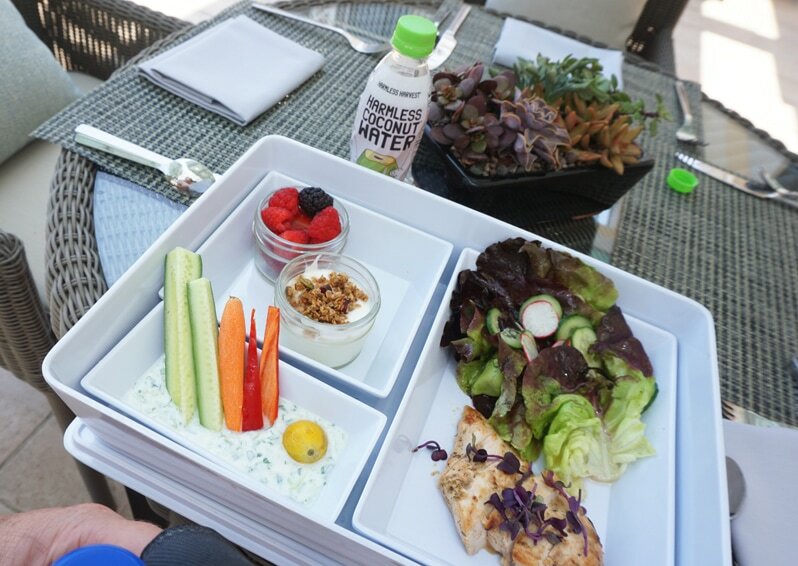 The spa menu also offers a variety of Bento box lunches. 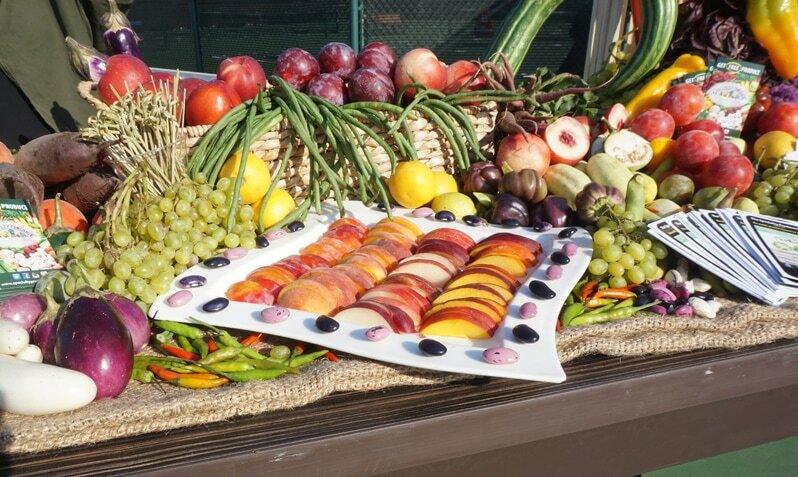 These healthy meals are perfect before or after a spa treatment. The chef and the hotel are great with food allergies. They were very accommodating with my gluten intolerance and luckily many of their dishes don’t need to be modified to make them gluten free. 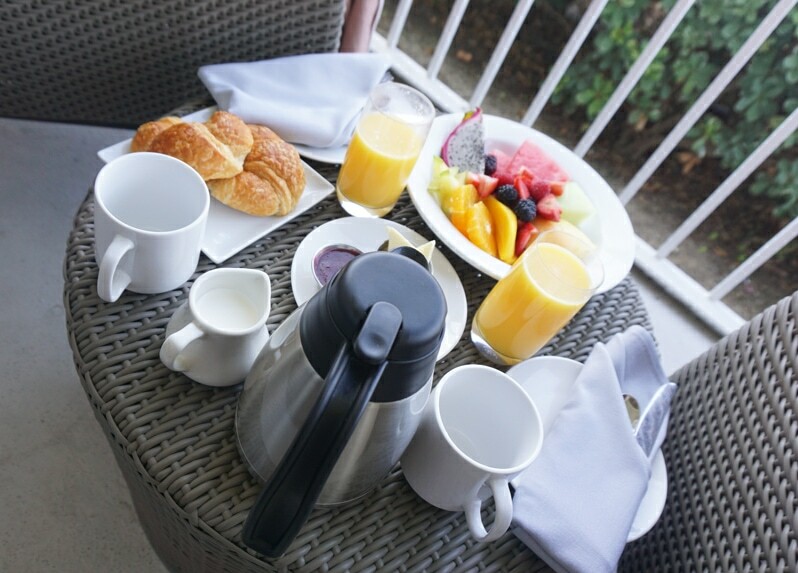 The hotel offers room service, which is a another perfect way to enjoy the gorgeous view of the bay or Coronado bridge. 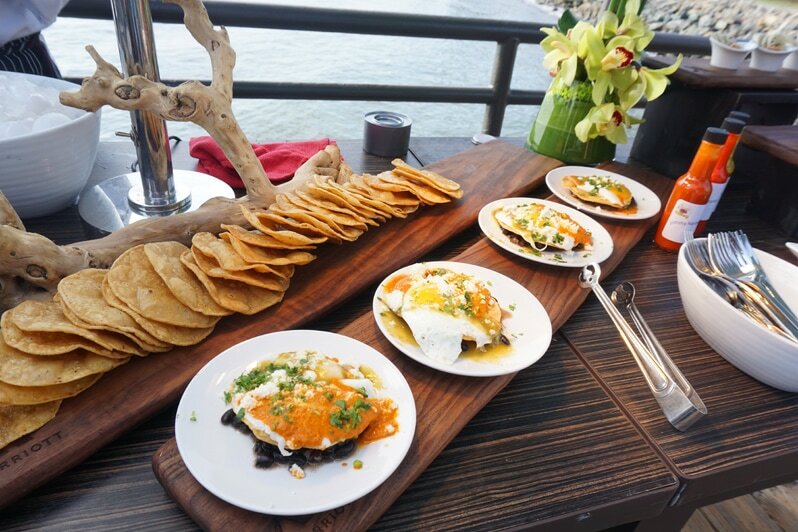 During my stay, we were treated to brunch on their private dock. 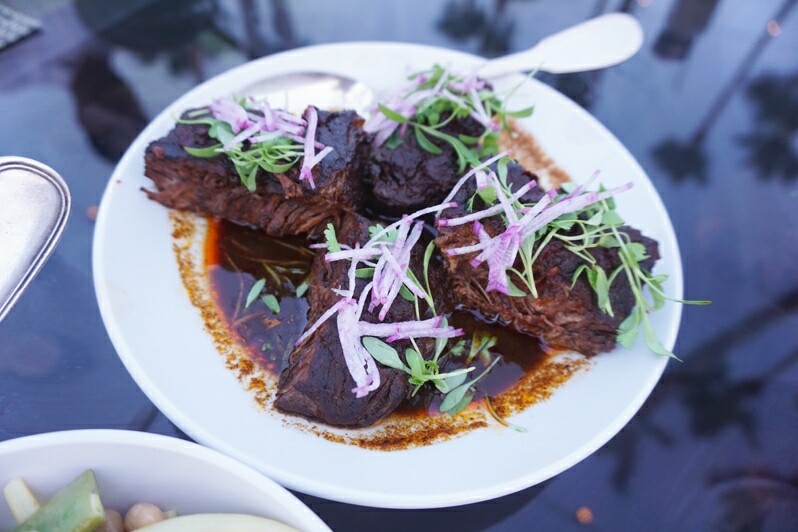 Executive Chef Michael Poompan created a feast for us to savor. 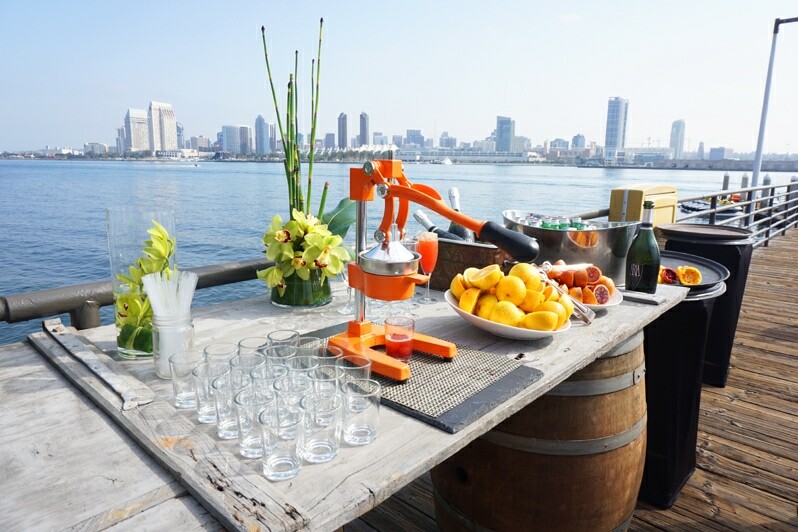 We began our experience with freshly made blood orange juice mimosa’s. 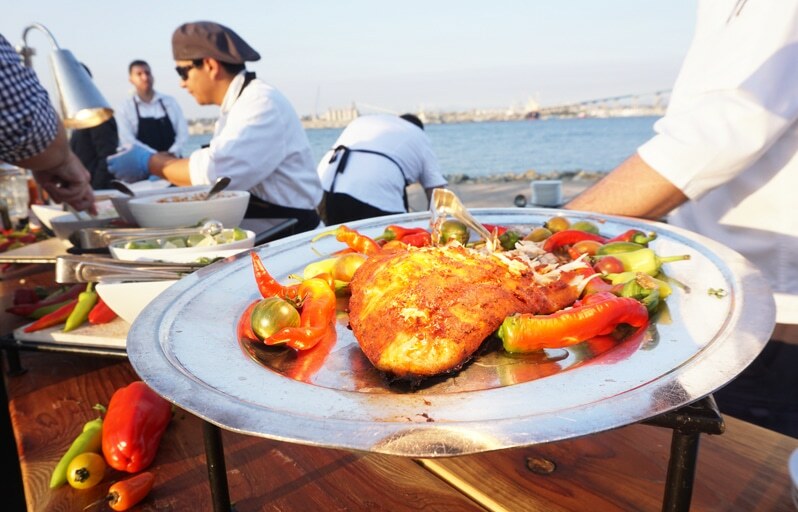 Between the view and the food, it was an experience to be savored. 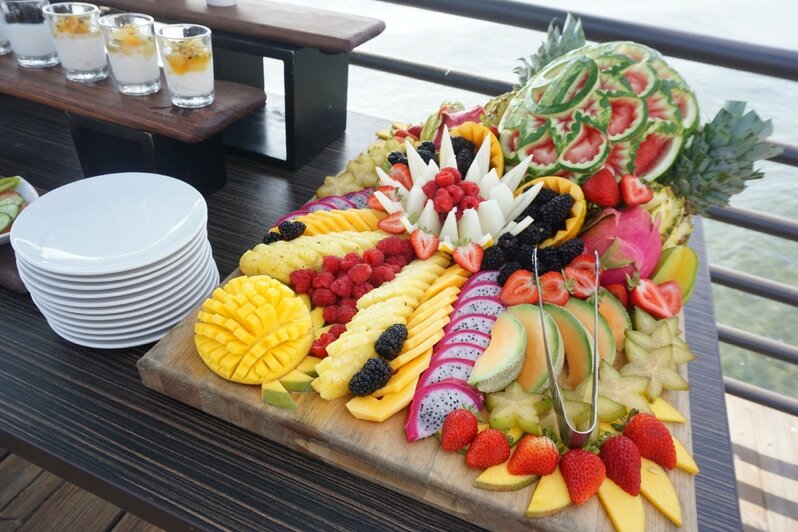 The Coronado Island Marriott Resort has one of the few fruit carving experts on staff. This watermelon was a true piece of art. One of my favorite dishes was cubed avocado with sea salt and a bit of spicy pepper. It was simple, but offered an amazing flavor combination. 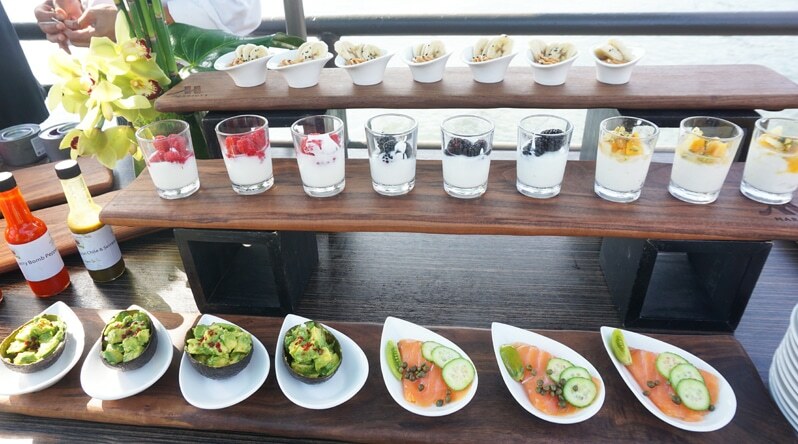 Breakfast also included salmon with cucumber and yogurt parfaits. 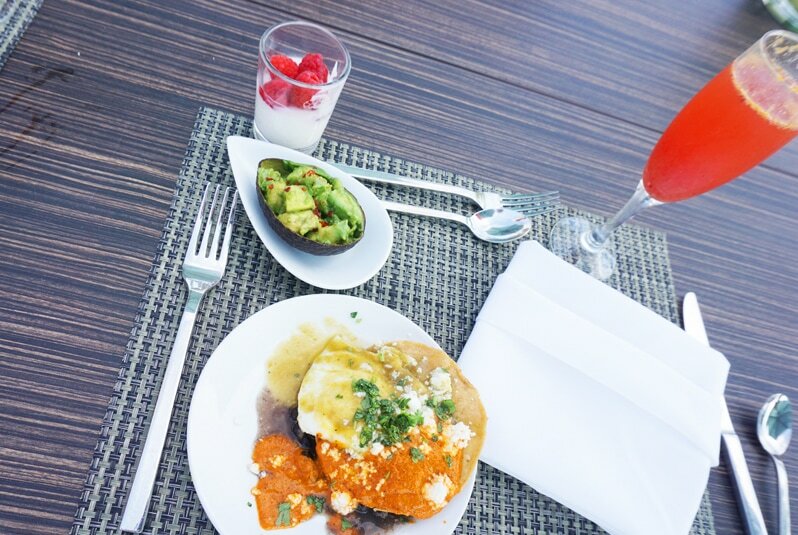 The star of our morning meal was eggs divorciados; a take on heuvos rancheros, but served with two sauces instead of one. Dinner was another treat, because Executive Chef Michael Poompan, selected our menu and joined us for dinner. Raw oysters on a bed of sea salt was our first appetizer, followed by an heirloom tomato salad, seared scallops and pork belly. Chef Michael Poompan certainly knows how to make food pretty, but he also knows how to make it incredibly delicious. 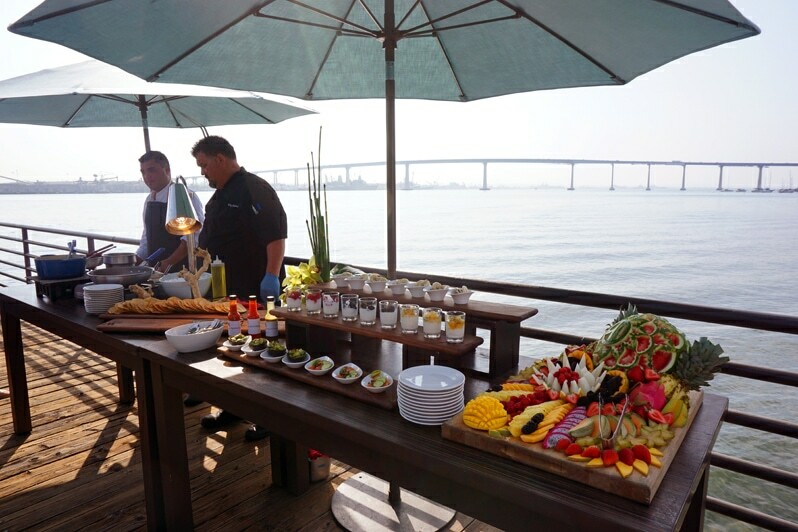 If you are looking for a beautiful San Diego location for a special dinner or want a foodie weekend away, Coronado Island Marriott Resort should be your first choice. A big thank you to Coronado Island Marriott Resort. I was a guest at the hotel but as always, all opinions are my own. This post contains affiliate links, which means that if you click on some of the links in this post and purchase something, I might receive a commission. There is no additional cost to you and I make a tiny bit of money to keep this website alive!